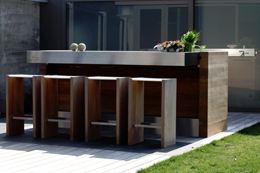 Adding an outdoor kitchen to your home is an outstanding way to invest in the functionality and design of your house. The ability to cook outdoors can greatly contribute to the time you are able to spend with family and friends. On hot summer days and crisp fall afternoons you can grill while you socialize instead of constantly running from kitchen to deck. Installing outdoor kitchen space can actually make financial sense if you grill frequently, enjoy the outdoor lifestyle or enjoy entertaining. It simply brings outside and inside together. It is a project that need not break the bank. If you work with an expert outdoor kitchen designer, he or she can help you set priorities and incorporate affordable elements into your outdoor living space. A built in grill is the essence of outdoor cooking. All that is needed is a source of propane. If you want to go a step further, you can wire the outdoor area for power to run an electric grill. Either way, you gain the ability to cook burgers, steaks and hot dogs by the pool or on the patio without endless trips to the kitchen. On a practical level, grilling is speedier and causes no mess in the indoor kitchen. Another option you should make allowances for is counter space. If you lack adequate prep space, you will have to run in and out – defeating the true purpose of an outdoor kitchen. You can opt to install an L-shaped counter in the corner of your patio or you can opt for a basic straight counter that, at the very least, gives you an area to prepare food or lay out serving plates or marinating bowls. Storage space is another necessity for your outdoor kitchen. You can be inconvenienced if all of your grilling tools and accoutrements have to be stored inside and you have to run back and forth to retrieve them. The larger your outdoor counter space is, the more storage you can incorporate. But if you are looking for the basics, one small cabinet and a carefully edited supply of grilling and cooking utensils will be great for your purposes. The main idea is to make sure that your new outdoor kitchen area makes cooking carefree and expedient. The goal is to create an effortless way to socialize while enjoying the fresh air. Game days and holidays will be simpler and more enjoyable if you can enjoy your company and know that that cooking tasks are only a few steps away. This addition to the home enables you to spend quality time with your loved ones, while also adding value and pride of ownership to your property. « What Does it Mean to be a Master Pool Contractor?